Judy and Thom, this is such a lovely, heartfelt day of sanctuary in honor of your daughters and grandchildren and the chimps! Thank you for holding the chimps in your hearts and for making a lasting difference in their lives. 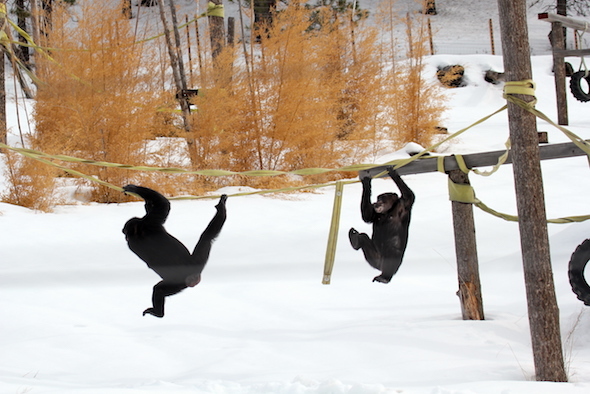 Happiest of holidays and winter seasons to you and your family from all of the primates at CSNW! What a great gift! It’s people like Judy and Thom Nash that give me hope for the world. I wish them and their family all the best in the coming year. Also, all the best to the great people that care for the wonderful chimps. You are all truly special! I dig the casual way at 2:20 that Foxie (I think) just pounds away on Burrito’s head like she dribbling a basketball. I can just hear Burrito haw-haw-haw-hawing his chimpanzee laugh. I too look forward to your posts. The photos and videos of these special beings warm the heart. Love and blessings to the chimps and all the great people that care for them.